The song is still the same, but the breathing is different. A new form of CPR takes out mouth-to-mouth resuscitation and instead focuses solely on hands-only chest compression — to the beat of the Bee Gees' song "Stayin' Alive." "The hands-only CPR is a relatively new approach," said Dr. Brad Bart, the head of cardiology at Hennepin Healthcare. "They always used to teach it that you had to do the chest compressions and then you had to do the mouth resuscitation." But research has found the current rate of bystanders performing CPR on people in cardiac arrest is just 36 percent in Minnesota. "After studying this they realized that some people are not getting CPR because of maybe the 'ick' factor; people really don't feel comfortable doing mouth-to-mouth resuscitation," he said. "So they looked at this whole picture, and they said, 'If we can just convince people that they don't have to do the mouth-to-mouth part, if they just do the chest compressions, that that's good enough.' And so many people will get CPR if people realize they don't have to do the mouth-to-mouth, that we'll actually end up saving lives." On Friday, Hennepin Healthcare unveiled a new machine to teach the hands-only form of CPR. The kiosk is one of 30 in the country operated by the American Heart Association, and the first in Minnesota. This one was sponsored by the Medtronic Foundation. Anyone walking by the kiosk, which is on the skyway level of the Minneapolis hospital, can take the five-minute training. The kiosk walks a person through the motions of hands-only CPR (to the beat of "Stayin' Alive") and then tests them. Alicia Bravo, an emergency room nurse at Hennepin Healthcare, survived cardiac arrest last year. She was doing swim training for a triathlon on a Wisconsin lake when she went into cardiac arrest. Her father pulled her out of the water and into his boat, and he and Bravo's sister performed CPR until first responders arrived. "Luckily I am here today and my heart beats because of CPR," she said. "My dad was my heartbeat." Bravo has since made it her mission to teach other people CPR. 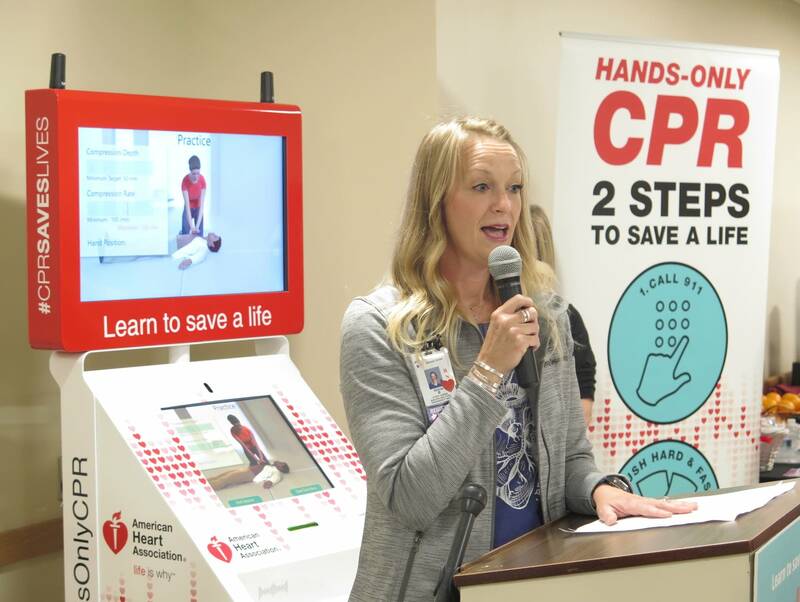 She encouraged the general public to use the machine to train themselves so they'll be ready when there is a need for CPR.